Sophie (Verras) Davidson – of Woburn, April 8th. Beloved wife of John P. Davidson. Loving mother of Melissa Davidson – Kyle, her husband Robert Kyle of Woburn and Stephanie Doyle, her husband Kenneth of Woburn. Dear sister of Andrew Verras, his wife Hope of Woburn and the late Angeline LeFever and Peter Verras. Cherished Yia Yia of Sydney, Reese, John, Dr. Wesley Kyle and his wife Caroline, Southbury, CT, Christopher Kyle Charleston, CT and Chelsea Kyle, NYC, as well as survived by numerous nieces and nephews. A Funeral Service will be held at 11 a.m. in Annunciation Of The Virgin Mary Greek Orthodox Church, 70 Montvale Ave, Woburn, on Saturday, April 13th. Interment in Woodbrook Cemetery, Woburn. Relatives and friends are respectfully invited to calling hours at the Lynch-Cantillon Funeral Home, 263 Main Street, Woburn Friday from 4-8 p.m. In lieu of flowers, remebrances may be made in her memory to Annunciation Of The Virgin Mary Greek Orthodox Church 70 Montvale Ave, Woburn, MA 01801. 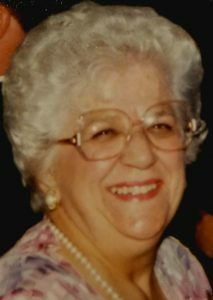 Woburn – Sophie (Verras) Davidson, 88 years old, passed away peacefully at the Sawtelle Hospice in Reading on Monday evening with her family at her side. She was the beloved wife of John Davidson for 57 years. Sophie was born and raised in Woburn by her late parents, Alexios Verras and Constandina Koufopoulos, and was a graduate of Woburn High School Class of 1948. Raised by Greek immigrant parents, Sophie’s life revolved around the Greek Orthodox Church. She sang in the Choir for 75 years and her beautiful soprano voice could be heard high into the rafters! She was also very in involved in the Philopticos Society for 70 years. The Society is the charitable arm of the church that supports the church community by holding bake sales and bazaars to finance scholarships and the elderly. Sophie’s high school years were pleasant and it was always a family joke that she played on the girls basketball team(she was 5ft. tall) She said that she was pretty good. After graduating, Sophie took the Civil Service Exam and did so well that she was quickly offered a job at the State Department of Mental Health–which she absolutly loved and made alot of new friends outside the tightknit Greek community. She had a very active social life–in fact, much more exciting than her parents were aware of. She would travel to Miami for a vacation with her friends–where she was lucky enough to sit in the first balcony at an Elvis concert in the 50’s!She loved the beach and spent many weekends up at Old Orchard Beach, in ME. Sophie and her friends volunteered after work in Boston at the Veteran’s Hospital. Dances were held on the weekends and it was at one of those dances that she met and danced with a handsome career sailor from Murfreesboro, TN who asked Sophie to dance and the rest is history. They dated, secretly were engaged for a few years until the time came for John to ship back to Norfolk for his last assignment before his retirement. They were married in January of 1962 and drove to Norfolk, VA. After their daughter Melissa was born, John retired to Woburn and Arlington Road became the famiy’s long-term home after the birth of a second daughter, Stephanie. It was a neighborhood that any kid in Woburn would love–lots of kids, lots of stay-at-home moms, easy to walk to all schools,the Hospital and uptown. Sophie and John and the girls enjoyed traveling to Tennessee each year to see family, go the Opryland, family farms and riding horses. Sometimes they would divert off the path to visit Navy buddies in VA Beach and Florida. Sometimes, the family traveled to the Cape. In her spare time, she volunteered weekly in the Coffee Shop at the Choate Hospital and she joined the Catholic Daughter’s Bowling Team (even though she wasn’t Catholic) and belonged for over 45 years. In her later years, Sophie and John began to travel with her sister Kiki and her husband Buddy to Las Vegas, St. Maartan, and to Foxwoods and Mohegan. Every election year, Sophie loved to work the polls with her cronnies at the Clapp School and had a blast! After her daughters were married, and they began to bless Sophie with grandchildren.Having her first grandchild at 70. The joy of spending time with her three grandchildren made her life complete. She especially enjoyed watching the grandchildren play and excell in Soccer, Basketball, lacrosse, track and baseball from Woburn Recrecreation to Woburn High. She was more than a wonderful and devoted wife and mother. She was really funny, even in her declining days. She was a genuine and valued friend and neighbor. She was a great “therapist” offering sound advice to all who needed her opinon. She was supportive–not matter how controversial the topic. She was highly intelligent and if she had been given the opportunity, she could have been anything. She accomplished all that she set out to do and she thanked God everyday for her blessings. Sophie was the beloved wife of John P. Davidson. She was the loving mother of Melissa Davidson-Kyle and husband Robert Kyle of Woburn, Stephanie Doyle and husband Ken Doyle of Woburn, loving yiayia to Sydney Doyle, Reese Doyle and John Kyle all of Woburn. She was also the loving step-grandmother to Dr. Wesley Kyle and wife Caroline of Southbury, CT, Chris Kyle of Charleston, S.C. and Chelsea Kyle of NYC. She is also survived by many nieces, nephews and friends. Loving sister of Andrew Verras and his wife Hope of Woburn and the late Angeline LeFever and Peter Verras. Visitation will be held at Lynch-Cantillon Funeral Home in Woburn on Friday, April 12, 2019 from 4:00 to 8:00 p.m. Funeral will be held on Saturday, April 13th at 11:00 a,m. At the Annunication Greek Orthodox Church, 70 Montvale Ave,, Woburn. Interminent will be a Woodbrook Cemetary, Woburn. Family and friends are welcome to attend. In Sophie’s honor, donations can be made to the Annunciation of the Virgin Mary Greek Orthodox Church in her memory. A Funeral Service will be held at 11 a.m. in Annunciation Of The Virgin Mary Greek Orthodox Church, 70 Montvale Ave, Woburn, on Saturday, April 13th. Interment in Woodbrook Cemetery, Woburn. Relatives and friends are respectfully invited to calling hours at the Lynch-Cantillon Funeral Home, 263 Main Street, Woburn Friday from 4-8 p.m. Please accept my sincere condolences upon the death of your dear wife and mother. Sophie and I had many a lunch together with a mutual friend Despina De Monico. So sorry for your loss. Those words are used so often and don’t seem adequate to express the love and sympathy we are sending your way. Our prayer is that you will quickly start reminiscing all the good times you shared over the years and be at peace.